Whitney Jennings looks for an open move during a game this season. Jennings scored 29 points against St. John’s on Feb. 1. Jimmy Lafakis/Collegian file photo. 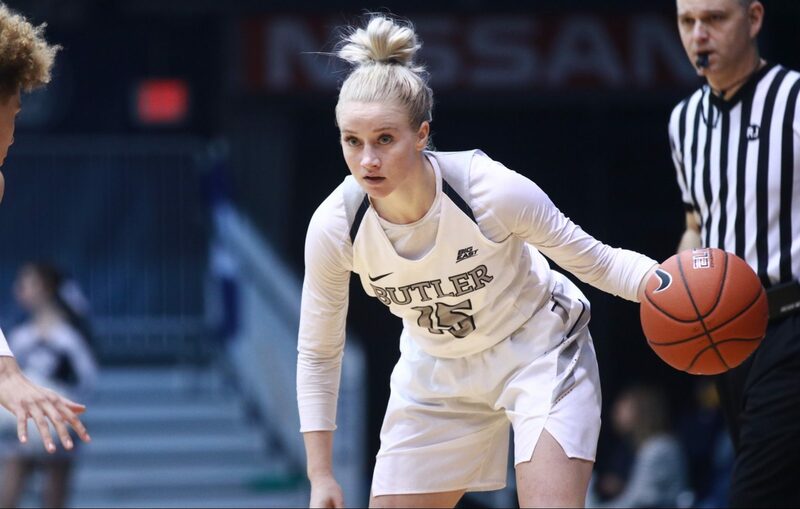 Whitney Jennings and Tori Schickel combined for 52 points as the Butler women’s basketball team defeated St. John’s on the road 73-68 in overtime on Feb. 1. The Bulldogs are now 17-4 overall and 7-3 in Big East play, while St. John’s is 9-12 overall and 2-8 in conference. Jennings led the way with 29 points on 9-of-19 shooting, which included five 3-pointers. Schickel scored 23 points, but her impact was felt greatest on the defensive end, where she had five blocks. Michelle Weaver tallied five assists along with four points. Notably, Butler outrebounded St. John’s 41 to 28, with Schickel snagging a game-high nine rebounds. Kristen Spolyar and Naira Caceres also added five boards each. The rebounding advantage propelled Butler to earning extra possessions, as they tallied 21 second chance points. St. John’s led by nine with 2:43 remaining in the third quarter, but thanks to the late-game heroics of Jennings and Schickel, Butler tied the game at 65 to end regulation time. Butler’s next game is in nearby South Orange, New Jersey, where they will face-off against the Seton Hall Pirates at 1 p.m on Sunday, Feb. 3.